It can be difficult for international students to bridge the gap between school and career. That’s one reason Flora Mutalifu decided that Dal’s Bachelor of Commerce would lead her to success. Indeed, Flora’s time in the program can only be couched in the language of success. 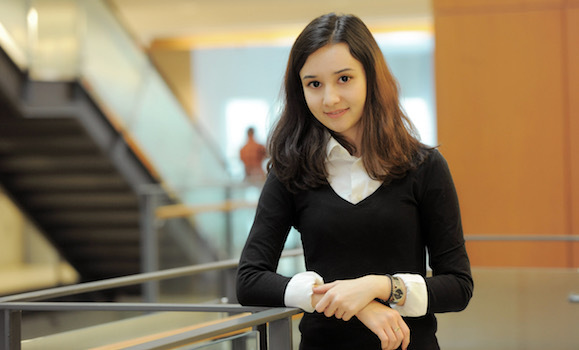 She has placed highly in case competitions, is the recipient of the Douglas C. Mackay Award in Money Management and will graduate with distinction. The co-op work terms, which enable students to apply what they learn in the classroom to real-world situations, attracted Flora to the program. “This is invaluable in building networks,” she says. With the help of job search resources from Management Career Services (MCS), Flora secured a spot with Scotiabank. She is keen to thank MCS’s Kelly Tracey for her support during the recruitment process. “Kelly really helped with the interviewing through coaching and motivation. The whole process was made a lot easier with her help. As an international student, or student in general, it’s difficult to know where to start or who to contact,” she explains.